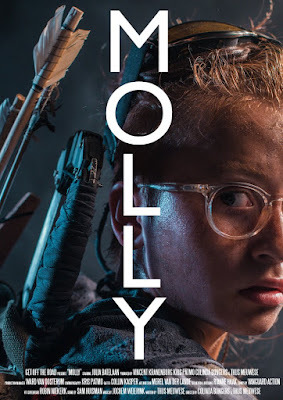 Artsploitation has acquired the US distribution rights to the upcoming sci-fi film Molly. It is a Netherlands production from Get Off the Road Films that was written by Thijs Meuwese, co-directed by Meuwese and Colinda Bongers, and stars Julia Batelaan, Emme de Paauw, and Joost Bolt. It had its world premiere on April 16, 2017 at the Imagine Film Festival. Artsploitation is planning to release it in the Summer of 2018. Check out the synopsis and trailer below. "In a post apocalyptic world where bullets have become currency and medicine is rare, a clan of marauders uses a home brewed drug to turn innocent people into rabid beasts to have them fight each other in their fighting pits for their entertainment. When their leader discovers rumors of a girl with superpowers roaming the beach near their fort, he sends his best people out to capture her. Meanwhile, the girl, Molly, has discovered a young child, living alone in a cabin in the wasteland, waiting for the return of her parents, who are probably dead. Molly has to protect the child and fight of the marauders at the same time."